Congratulations, you’ve decided to get married. Getting engaged is one of the most memorable moments in your life so making your marriage proposal special is very important. That means you need to think about a few details before you ask her to marry you. That's right, you need to do some planning! Like, when is the perfect time to ask her to marry you? Where is the perfect place to ask her to marry you? And how should you ask her to marry you? And of course one of the most important engagement items to think about is the "sweep her off her feet" engagement ring! Now that you're feeling the pressure, let me help you with some of the answers to these important questions. First, if you are reading this it means you have found your special someone and you know deep in your heart she is the one to spend your life with. You think about her constantly and can't wait to be in her company again when you are apart. You can't think of your life without her and you are now ready to ask her to marry you and start your engagement. Just remember that your marriage engagement takes a lot of planning on your part, and the wedding day planning takes more planning on her part! Let's think about the engagement ring for a moment. Will you want to surprise her with an engagement ring that you think she will like or will you be together looking for the perfect ring? You must remember that every girl dreams of the day she gets engaged and then married. The wedding engagement and wedding day has been planned in her mind since she was a little girl! To her you are her knight in shining armour coming to sweep her off her feet and fulfill all her dreams. Marriage and especially your wedding day is the time to pronounce your undying love and commitment to her before your friends and family. Whether you pick a ring together or you want to surprise her with a stunning engagement ring, here at Novori.com we can help. Selecting an engagement ring setting is the first step and, hopefully, you already have an idea of what she likes. Walking past a jewelry store in the mall and stopping to see which ring her eyes linger on, this will help you make your decision. Once you have chosen the engagement ring setting, you need to choose the perfect diamond center stone for the ring. As for the when, where and how of this momentous occasion you need to take time thinking on this one. Those questions will be answered differently for each couple! Still, you need to think about fulfilling her dreams for her wedding engagement! Places that are special to you both are definitely a consideration here. For me it was a beautiful park setting where we started dating and later on had our wedding day pictures taken there as well. "I will never forget the day he asked me to marry him" is what you want her to say years later. Just remember this marriage proposal is a special time for the both of you so put some effort into it to make it special for both of you. - Choose a location for the proposal that is special for both of you. 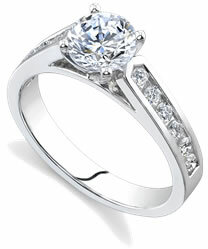 - Have a diamond engagement ring that she will love. - Make your engagement proposal romantic and unforgettable. - Don't bring your friends along to witness the marriage proposal. - Don't hide the engagement ring in a dessert or other food! - Don't ask her to marry in in front of a crowd. It's a personal thing. Making your marriage engagement day special and romantic is extremely important, a day she will never forget so spend the time and effort planning your marriage engagement. This is a once in a lifetime event and the perfect diamond engagement ring is a must! Here at Novori we can help you pick a stunning engagement ring that she will cherish and love for years to come. We have thousands of high qualtiy certified diamonds at affordable prices to choose from. We realize that this is a exciting yet scary time in your life and we will help make it easy for you, at least with the part of picking an engagement ring!